Stealth bombers are not invisible—far from it, in fact. The Northrop Grumman-designed B-2 Spirit has a hard-to-ignore 175-foot wingspan and a thin, disk-like silhouette that makes it look like a cross between a stingray and an alien craft from a summer blockbuster. Turns out, it's not just one thing; many factors contribute to a B-2's supersneak powers. There's no invisibility cloak here. B-2s combine the best radar-evading tech and design into a remarkably effective low-observability cocktail. In fact, since it was first displayed in 1988, only one B-2 has ever been lost—and not in combat. So the plane's under-the-radar (and infrared, acoustic, electromagnetic, visual, for that matter) design has been doing its job well. See, there's more special about the plane than just its stealth status. The B-2 can also carry a huge weapons payload. Combine that with the ability to approach targets undetected, and this extremely expensive plane (we're talking billions) is quietly proving its worth. The B-2's shape gets most of the credit for keeping it off enemy devices. Major Timothy Hale, a former B-2 pilot, explains, "If you shine a flashlight at a mirror, and that mirror is straight on, 100-percent of the light shines back at you. Same goes for radar energy, but the shape of the airplane can deflect or control where it goes; you want that energy to go anywhere but back to your enemy's radar array." He wouldn't go too deep into the details, but the gist is that the B2's angled outline is for more than just intimidation; it confuses radar pings so that they never find their way home. The plane's v-shaped design—also known as a "flying wing"—helps the B-2 soar undetected, as do the slopes of its sides, which have 33-degree angled front edges. Engineers also took any part that would typically jut from a plane and smoothed it out for the B-2's design. The slim profile makes it extremely aerodynamic and allows it to fly wicked fast—but more than that, the shape keeps it from enemy cross hairs. "A regular airplane has got lots of things hanging off of it," says Major Hale. "When we take those surfaces off, it offers us a pretty low radar cross section." 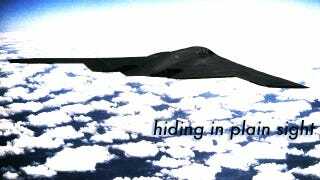 Together, the design, materials, and just good planning make the B-2 the most advanced "low-observability" craft around…until, of course, we figure out the cloaking device. You can keep up with Rachel Swaby, the author of this post, on Twitter or Google+.